Ebony inlaid Titanium wedding ring featuring a 4mm wide inlaid band of natural black Ebony wood around a 7mm satin finished Titanium flat court band. This distinctive inlaid Wedding Ring is crafted in precision engineered Titanium. 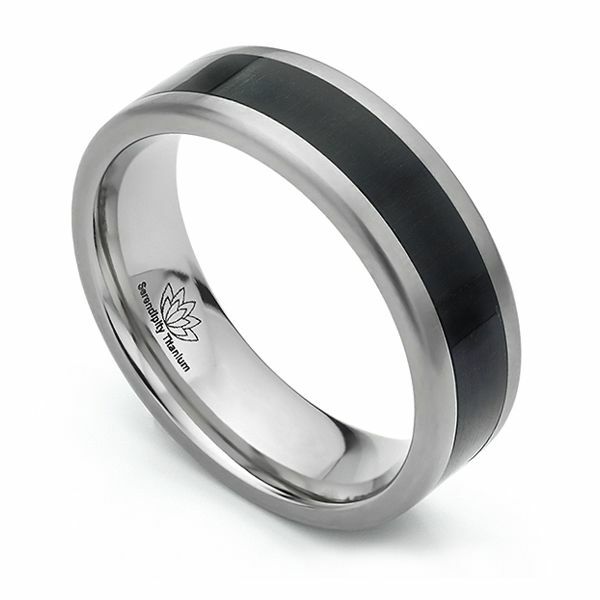 Your Wedding Ring will be created specially to order and inlaid with a rich, dark African Ebony wood. Measuring 7mm in width, the Titanium band features a comfort fit, perfect for everyday wear. At the heart of this sophisticated ring design, the 4mm inlay provides a bold contrast to the satin brushed finish of the Titanium. Please allow 3-4 weeks for this ring to be completed before it is hand delivered by secure courier to your door. We include beautiful packaging and Worldwide shipping to many locations. Ebony is a dense black hardwood, most commonly yielded by several different species in the genus Diospyros, which also contains the persimmons. Ebony is dense enough to sink in water. It is finely-textured and has a very smooth finish when polished, making it valuable as an ornamental wood. Please note that our wood inlaid wedding rings cannot be re-size. Each ring is created individually as a bespoke commission. As a result, we make each ring specifically to your finger size. We can provide a free ring sizer and we can send out the additional 3 ring size samples on loan to ensure the perfect size. In the event that you need an alternative size, we will re-make a brand new ring in the correct size. We charge a £45.00 re-stocking charge to return the original ring and apply a nominal charge of £45.00 for re-making the new ring in your correct size. What happens if the wood part of the wedding ring is damaged during wear? We offer a replacement wood inlay service in the event of damage or wear to the central wood section of the ring. The cost of this service works out to £150.00 GBP and takes around 2 weeks to provide. Your wood inlay wedding ring will be re-finished as part of this process. Find answers to many of your questions on our Titanium and Zirconium information page below. Our Titanium and Zirconium guide is essential reading before purchasing your Titanium ring. We deliver worldwide from the UK where all of our Titanium and Zirconium wedding rings are crafted. Delivery locations include UK, Ireland, Europe, Channel Islands, USA, Australia, Canada, Switzerland, Hong Kong and many other countries. All items are beautifully presented and delivered with free shipping. For deliveries outside Europe, to USA, Canada and Australia, all duty and taxes are included at checkout. If you need any additional help, please don't hesitate to contact us by online chat, or send a message and we'll respond with any help you need. Our team are on hand most days to provide live support through the chat window on-screen.